Quickly download videos from YouTube website. 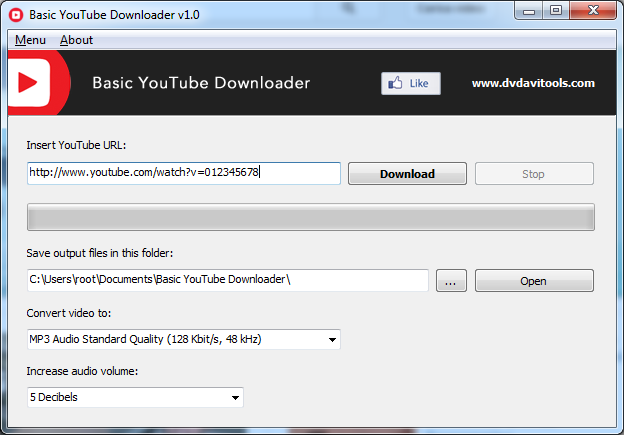 Basic YouTube Downloader is a free application for Microsoft Windows that lets you download videos from YouTube and convert them to video files or audio files. Downloading videos from YouTube couldn’t be easier, you just need to type the link of the video, select the output video format and click the button “Download”, that’s all. With Basic YouTube Downloader you can convert YouTube videos to up to 57 video and audio formats, including Android (MP4), Iphone (MP4), Ipad (MP4), Sony PS3 (MP4), Divx (AVI), Xvid (AVI), Cell Phone (3GP), Flash Video (FLV), Matroska Video (MKV), H.264 Web HD Video (MP4), MPEG-4 Video (MP4), SVCD/VCD (MPG), WebM HD Video (WEBM), Windows Media Audio (WMA), MP3 Audio, Wave Audio (WAV), and much more.